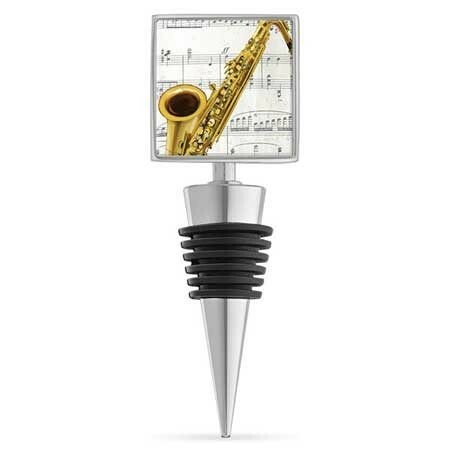 Saxophone Bottle Stopper – “Jazz” up that bottle of wine with this beautifully crafted bottle stopper. Featuring an inlaid enamel graphic of a saxophone and music sheet background, this sealer also has a polished metal base as well as a flexible adjusting width rubber seal to keep the bottle air tight. A unique music gift that’s perfect for the jazz lover, music lover or saxophonist in your life. Approx. 1.5″ x 4.125″. Saxophone Gifts for Saxophone Players!